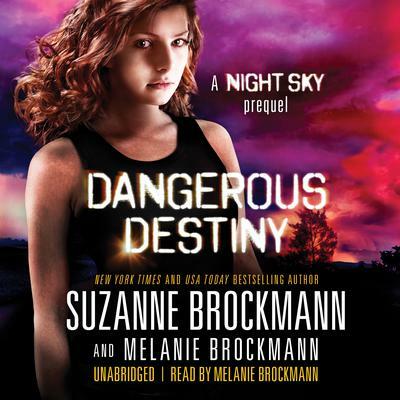 In this pulse-pounding prequel to the Night Sky series by New York Times and USA Today bestselling author Suzanne Brockmann and her daughter Melanie Brockmann, Skylar has her first brush with Destiny. She’s about to meet a boy who will change her life—and a girl who wants to end it. I know her. Know her from inside the dreams. Inside those terrible, murderous, bloody dreams. I’ve heard her—screaming, her voice mixing in an awful chorus with all those other girls. Little girls. Please, God. That’s what one of the little girls keeps saying, in the dream that is not just a dream. Please, God. But I know better. There’s no escaping this fate. This is destiny. I must kill Skylar. Skylar Reid is the new girl at school. Her mom just moved them to Florida—a.k.a. the Land of the Living Dead, where the average age of her new neighbors is seventy-five—to start over. Skylar is not a fan of the change or her total lack of friends. Then she meets Calvin, a funny, sarcastic boy who doesn’t let being in a wheelchair stop him from verbally shredding their preppy classmates. Skylar’s just about to decide her new school’s not a total loss, when an odd girl wearing an oversize trench coat in the murderous southern heat declares, “You’re one of us!” and then tries to kill her. Don’t miss out on YA’s most thrilling new series. Know her from inside the dreams. Inside those terrible, murderous, bloody dreams. I’ve heard her—screaming, her voice mixing in an awful chorus with all those other girls. Little girls. Skylar Reid is the new girl at school. Her mom just moved them to Florida—a.k.a. the Land of the Living Dead, where the average age of her new neighbors is seventy-five—to start over. Skylar is not a fan of the change or her total lack of friends. Then she meets Calvin, a funny, sarcastic boy who doesn’t let being in a wheelchair stop him from verbally shredding their preppy classmates. Skylar’s just about to decide her new school’s not a total loss, when an odd girl wearing an oversize trench coat in the murderous southern heat declares, “You’re one of us!” and then tries to kill her. Don’t miss out on YA’s most thrilling new series.